Home Reviews Review: 70816 Benny’s Spaceship, Spaceship, SPACESHIP! 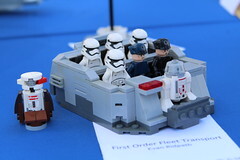 There are a whole bunch of stories from AFOLs that had their lasting LEGO memories thanks to Classic Space sets. Those little spacemen rocketing around in blocky ships, elements like transparent wings and windscreens, and all sorts of crazy rovers and shuttles. That’s probably why Benny was such a wonderful character in the LEGO movie, since he hit that little fusion between kid’s love him (“SPACESHIP!”) and a call-out to AFOLs with that broken helmet piece. I wasn’t one of those classic space kids, as I’ve covered in other reviews. Don’t get me wrong, I loved space stuff, but my Sci-Fi love was pretty limited to Star Wars and Star Trek… otherwise most of the stuff I built was actual rockets or space shuttle stuff. I mean, I admit to owning GoBots just because they had Spay-C and she turned into a Space Shuttle. So something like Benny’s Spaceship was an interesting build, but not one based on nostalgia or reliving my childhood collection (that’s what modular buildings and castle are for). This is obviously a bit on the late side for this model, since it’s been out for about a year at this point, but hitting plenty of sales and clearances. Benny’s Spaceship isn’t a cheap set, per se, listing at $99 (but frequently hitting sales and clearance in the 70-80 range), but has a great little selection of parts, and before this year’s release of the Double-Decker couch or last year’s MetalBeard’s Sea Cow, was the set that most of us would be able to get our little blue friend with. Classic Space Unikitty and Wyldstyle were nice bonuses, as well as a foil-wrapped Emmet. In short, this had a set that had all kinds of wow right out of the gate. Given that time is running out for this set (until the updated version comes with the sequel), the question is, should you drop some money on this 940-part set (or on a second one, or third, or forth)? Yes, yes you should. I’ve thought about picking up a second one for my daughter, actually, to go alongside the Shuttle Adventure set (which I would have been crazy for as a kid). This was perhaps the most fun set I’ve put together since the Ecto-1, and probably one of the most entertaining sets to build as an adult. Even though I wasn’t a Classic Space guy, you just appreciate the blending of classing and modern building styles in the set. For minifigures, we obviously get Benny (all sets should come with Benny… not just Movie sets), a foil-wrapped Emmet, space-themed Wyldstyle and Uni-kitty, and a nameless Octon Robot pilot. It’s a bit disjointed as a lineup, since when we see the spaceship in the movie, Emmet has been tossed into the void and there were pilots shown for a few seconds before it became all about robot skeletons for some reason. Come to think of it… they never really did explain why there were so many robots around there. Any any kid I know, there were two stars of this movie… Uni-Kitty and Benny, so it’s always nice to see her in a set. That she’s sporting the Classic Space logo and a full space suit is just a bonus, like a fusion of the classic and new in that annoyingly cute package. This version is obviously unique to the set, and awesome, so you’ll know you’ll want her. We do get an Emmet in the set, which is a bit unusual, since he was never really around for this particular ship in the movie. It had been wrecked by the time he got back to the city (after terrifying all adults with the prospect that minifigures are capable of moving on their own). The foil pattern is nifty, and it’s cool to have a piece of resistance in flat silver, even if the color uniformity problems of that particular color are MegaBloks bad (seriously, I got a couple of slopes in the Deep Sea Manta set that are Best-Lok color bad). I quite like the figure, I just really wish their was a matching Wyldstyle in the foil to go with it. It would have been a cool little set to make it on its own, as the whole Emmet + Lucy thing was kind of important to the film. Plus, they could have made an awesome set with that laser cage and the swinging to get the Kragle. Wyldstyle appears in her space form… which actually tells me I need to go watch the movie again and see if she was actually wearing this when they escaped. * looooooong pause * Whatever I find out goes here. I think the alternate face I would have loved to see on a Wyldstyle figure is the exasperated look that she got when she had to explain something to Emmet (which was pretty much all of the time). I’m thinking the look when he told her and Vitruvius about the double-decker couch the first time. You just have to love the stylized look she had, which was cliche in the normal figure, given the classic space spin to it. 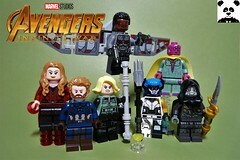 Plus, that hood piece will likely show up in a lot of other minifig builds. I would love to get extras or different colors for some of the city figures I have wandering around my modulars. SPACESHIP! My first impressions of the Lego movie were formed by this guy, honestly. Before I saw the a large spinning block in the theaters, and spun it around to see that Benny’s helmet was broken, I figured that it was just another forgettable animation like their… well, everything. The purposefully faded logo, the broken chin (which is actually molded so it won’t break), and that huge grin were all huge callouts to adults (and AFOLs especially) that grew up with these figures. At that moment, I knew that the movie was going to be something different from what LEGO had given us before. 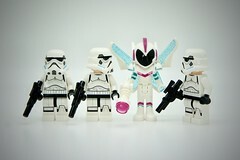 The last minifig to round out the set is a rather forgettable robot pilot. Like I said earlier, there are robots flying ships chasing after Benny’s spaceship, but most of what I remember in the movie are Micromanagers and robot skeletons fighting our heroes. This guy is the one that tells them to attack the ship on the run, but after that, he’s not really seen. Unlike the other figures, which work all put together, this guy is actually more interesting as parts than the final figure. The torso is a good space torso with the Octan logo, and that’s always nice, and who doesn’t always need more plain black legs? The big standout though has got to be the head, which I’m just waiting to show up in some Fallout or Killzone related minifigures. Anyone who has played either of those games may not unable to get that thought out of their brain until they fit one together. One thing that we AFOLs often lose site of, and one of the underlying messages of the Movie, is that LEGO is still a kids toy. That was basically half the dialog of the live-action part of the movie (and how I wish I had a basement like that). I’ll admit that I’m guilty of this, especially when MOCs or contest entries come up that aren’t built with the kind of skill or polish that adults put into things (and kids rarely do). Give a kid a stack of LEGO bricks and it won’t take long for you to see a monstrosity you could never imagine. My daughter is only two and a half, and I’ve seen her take Duplo (which really do come to destroy all your things) and build a rolling car full of animals that she picks up and flies around. A model like Benny’s spaceship is pretty much impossible in the modern LEGO world. It’s a fusion of those classic blocky designs, modern slope-happy ships, and the slapdash builds that kids make . It’s easy to see the inspirations for this set in earlier Classic space models, and their beautiful studs-exposed, blocky mess that we’d all likely dismiss as ugly if they were released now. I’ll admit that even though I wasn’t into Space as a kid, I built a whole ton of things that looked like that… typically Star Trek inspired. 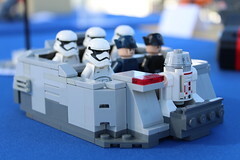 Let’s just say I had more than a few LEGO shuttlecraft that were manned by horses and knights. The ship is loaded with several subtle play features, but make no mistake, it’s designed to be picked up and swooshed around. 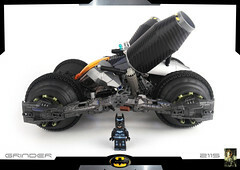 The two little shuttles on the wingtips can be disconnected (I’d suggest you load it up with Batmans… seems like he’s in every single set LEGO makes) and flown around, the center flips up, and it has every type of missiles on there (spring-loaded, flick-fire, and new flick-spring). There are a couple of robots tucked away under the back. I’d suggest you leave them in there, because looking at them is typically enough to cause the arms to fall off. If you pick them up, I assume they’ll explode into individual pieces and immediately fall into the gaps of your couch. Even if you’re in a room without a couch. They’re that flimsy. This is probably the coolest little spin on the ship, a serial number tile that’s unique to every set (at least as far as I’ve been able to tell). It’s just a nice little touch that calls it out that this is my Benny’s SPACESHIP, and I like that. You can tell when a set designer is into what they’re building, and this is a set built out of love (and bricks). It’s not all perfect, as much as I would like to say it is. The whole build is incredibly fragile until you get to the end, when things start to really lock into place. There were a few points where the whole length of the ship is held by a few studs, and it will likely break apart if you lift it up (you know, like the instructions tell you to do). The stickers on the back wing are also especially problematic. If you put them where the instructions point you to, they’ll hang over the side. You have to work on the positioning carefully and apply them in a place where it won’t hang off the wing, which ends up being the lower section of the wing. Unikitty gets her own little section in here as well… the ship is built to hold more figures than come with it (and that’s not counting the wing shuttles… which I don’t remember in the movie at all anyway). The missing figure here is Batman, who took a bit longer to show in a movie set (and, now, much like DC Super Heroes, is seemingly in all of them), but the missing part in the set is MetalBeard more than anything. For the entire fight with the ship, MetalBeard was a passenger sitting on the back and smacking around robots with laser sharks or cannonballs or something. Unfortunately, there really isn’t even a spot to place him on the ship, which feels like a pretty big gap when you watch the movie again and check out this ship, specifically. You can kind of fit him on top of the dish area, but the build for our pirate buddy doesn’t make him easy to put… well, anywhere. Of course, that didn’t stop me from putting him on top of the ship when it’s on display (and tucking Batman from the angry kitty set in there as well), but you have to remove him to swoosh the ship around. Once fully assembled, the ship is quite swooshable. The only fragile parts are the wings, which on a scale of one to five Naboo Starfighters (the most fragile build in the history of ever), it’s about 3.5 Naboo Starfighters. The little shuttles stay on pretty well, despite using only a single hinge, and still make for nifty little additions. The one Octon shuttle is okay as well, though it’s as forgettable as the pilot who flies it. They took down our heroes through overwhelming numbers, and there’s only one here, so if you want to recreate the battle, you need to buy about a hundred more of this set and just discard the Benny’s SPACESHIP part. I can send you an address you can “dispose” of those parts to if you’re going that route. In the end, was there going to be any doubt about this set? 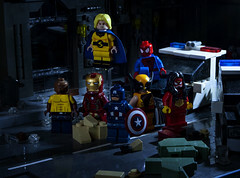 As soon as it was leaked early last year, and when it was seen in the movie, it was a given that LEGO had a home run set on their hands. This leaves us with only a couple of big set gaps in the Movie lineup, namely the Batwing, the Octon Cargo Ship, and the Western Chariot. Luckily, the beautiful thing about the movie is with enough parts, you can build any of those things. This set is a solid five. If we had six, I’d award it for the set on sale, but you won’t be disappointed paying SRP for the set either. The only real risk is waiting at this point, because it won’t last forever, and this has the makings of something that will spike on the aftermarket once it dries up. Who knows how much life LEGO is going to get from the Movie sets… we got a few this year but there’s nothing else on the horizon. The Spinoff movie will help make up for the Batman set drought we always seem to go through (there were only like eighty-four Batman sets released this year), but we won’t likely see Benny again until LEGO Marketing Movie comes out in a few years. Some fantastic exclusive figures. I mean, who doesn’t need more Unikitties?